TEANECK, N.J., Jan. 12, 2017 /PRNewswire/ -- Cognizant (NASDAQ: CTSH) today announced that market intelligence and advisory services firm International Data Corporation (IDC) has named it a Digital Transformation "Leader" in the life science industry. 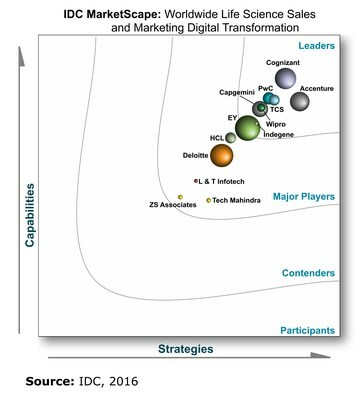 Two IDC reports — the IDC MarketScape: Worldwide Life Science Manufacturing and Supply Chain Digital Transformation 2016 Vendor Assessment and the IDC MarketScape: Worldwide Life Science Sales and Marketing Digital Transformation 2016 Vendor Assessment — highlight how Cognizant's digital expertise is solving some of today's most pressing business challenges for pharmaceutical, biotech and medical device companies. Working with 27 of the world's top 30 pharmaceutical manufacturers and 9 of the top 10 biotech companies to address intense competition, changing global regulations, and evolving expectations of digitally native consumers, Cognizant is helping life sciences companies implement digital technologies from cloud computing to the Internet of Things (IoT) to better connect patients, physicians, and providers, improve health outcomes, and enhance business processes for lower costs and higher efficiency. "Traditional business models are giving way to a new, digital economy where the agile enterprises embracing digital systems and technologies are the winners," said Krish Venkat, President, Healthcare and Life Sciences at Cognizant. "Cognizant's mission is to enable clients to make technology more efficient, including applying cloud-based platforms, automating processes, and creating meaningful customer experiences. Together, we're bringing ideas to implementation in areas like digital patient engagement, outcome-based service delivery models, and even a paperless intensive care unit. Being recognized as a Leader in digital transformation by the IDC MarketScape is a reflection of our deep understanding of the life science industry and our continued investment and innovation in IoT, analytics, and cloud, social, mobile, and platform solutions." "Digital transformation is occurring rapidly in the life science industry, across both the manufacturing and supply chain, and the sales and marketing spaces," said Mike Townsend, Research Manager for Life Science Business Systems Strategies at IDC. "As manufacturing IT platforms have migrated to the cloud, IoT and mobile devices are proliferating, helping connect far-flung manufacturing and supply chain partners in real time. New regulatory requirements, coupled with the globalization of manufacturing, have accelerated the need to digitally transform manufacturing and supply chain processes." Townsend continued, "Similarly, digital transformation is imperative for sales and marketing organizations. Internal and external sources of data are being collected in the cloud, and this information is being leveraged to improve speed, efficiency, and effectiveness in reaching both healthcare providers and patients. Partnering with technology vendors such as Cognizant, with expertise in transforming business processes and leveraging digital competencies, is critical for life science companies for improved outcomes, growth, and productivity." 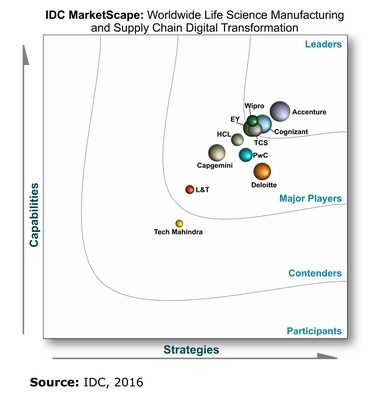 The IDC MarketScape: Worldwide Life Science Manufacturing and Supply Chain Digital Transformation 2016 Vendor Assessment (doc #US40510516, September, 2016) analyzes 11 consulting and digital transformation service providers worldwide, evaluating their ability to deliver services that utilize or combine digital information or processes, and on the proportion of revenue generated by life science engagements. In the report, Cognizant was rated highly for project budget performance and for its experience in digital transformation throughout the supply chain, implementing IoT, smart manufacturing and monitoring, and smart analytics solutions that improve the quality, visibility, lead times and security of the supply chain. By coupling industry-specific supply chain and manufacturing experience with a broad range of technology capabilities to create and deliver effective digital solutions, Cognizant's Life Science and Medical Devices practice focuses on understanding the unique challenges facing clients today such as evolving global serialization and track and trace regulations, new health care delivery models, and an increasing focus on operating efficiencies driven by global pricing pressures. The IDC Marketscape: Worldwide Life Science Sales and Marketing Digital Transformation 2016 Vendor Assessment (doc #US40510716, July 2016) analyzes 13 vendors around the world participating in digital transformation of sales and marketing in the life science industry. Vendors are rated on current capabilities, future strategies, and the proportion of revenue derived by life science engagements. In the report, Cognizant was rated highly for life sciences industry expertise, with particular emphasis on its digital asset management platforms. The IDC MarketScape study characterizes Cognizant as an innovative partner, citing Cognizant's integrated approach for supporting sales and marketing digital transformation. By combining the creative and design experience of a marketing agency with deep domain knowledge, commercial data analytics, data sciences capabilities, and global distribution centers for delivery execution, Cognizant enables life science organizations to better connect with patients, physicians, providers, payers and policy regulators. Leveraging its investments in platforms to enable digital transformation, Cognizant offers life science enterprises its commercial operations platform OpSERV; the data management platform BigDecisions Sales Analytics; and its brand analytics platform REVEAL, among others. To learn more about Cognizant's Life Sciences expertise, visit: https://www.cognizant.com/life-sciences. Cognizant (NASDAQ: CTSH) is a leading provider of information technology, consulting, and business process services, dedicated to helping the world's leading companies build stronger businesses. Headquartered in Teaneck, New Jersey (U.S.), Cognizant combines a passion for client satisfaction, technology innovation, deep industry and business process expertise, and a global, collaborative workforce that embodies the future of work. With over 100 development and delivery centers worldwide and approximately 255,800 employees as of September 30, 2016, Cognizant is a member of the NASDAQ-100, the S&P 500, the Forbes Global 2000, and the Fortune 500 and is ranked among the top performing and fastest growing companies in the world. Visit us online at www.cognizant.com or follow us on Twitter: Cognizant.